Italian Minestrone Soup | Live. Learn. Love. Eat. As I have mentioned before, I love making meals with enough leftovers for the next day. I figure that if I am going through the trouble and mess of cooking something, I may as well make a lot of it, especially with having a three month old and not as much time to cook. I often double my baking recipes and if I am making a meal I usually make enough for our family to have twice. I have made many soups and usually stick to my Mixed Bean Garden Vegetable Soup recipe, but I wanted to try something a little different this time around, a minestrone soup. 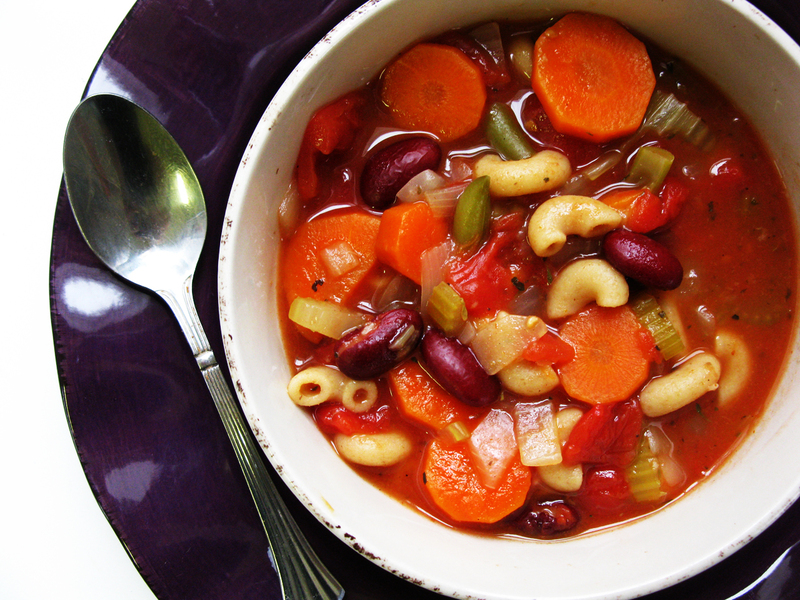 With a little bit of Italian spices, garlic and some whole wheat macaroni, this soup turned out to be a perfect Italian minestrone. We all enjoy soup with homemade bread warm from the oven, especially during the colder months. 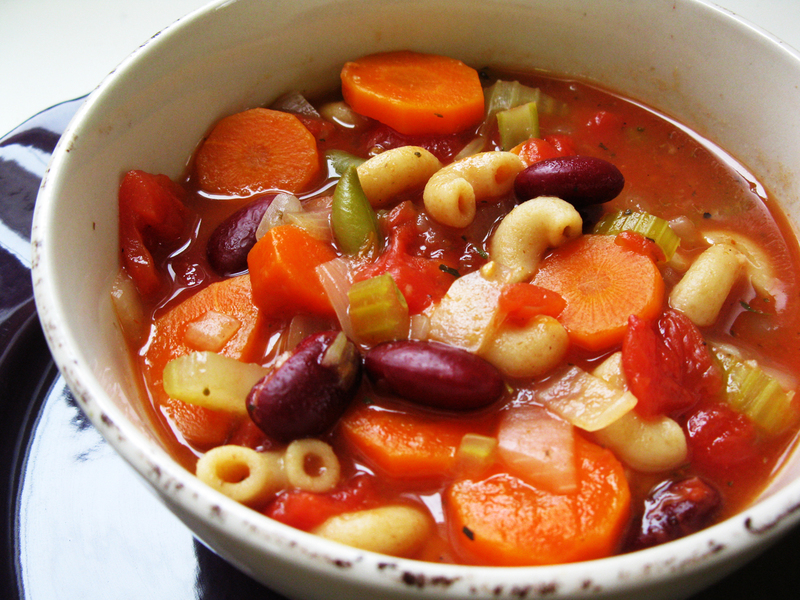 This is a nice hearty soup made with vegetables, whole wheat macaroni and red kidney beans. The addition of Italian spices gives it a little extra flavor and makes for a little different soup experience. Makes one large pot of soup, feeds my family of four for two meals. Make half the recipe if you need less soup. Bring the 8 cups of water to boil in a large pot. Add the onion, celery, carrots and frozen green beans and boil for 5-10 minutes, until the vegetables begin to soften. Add the canned diced tomatoes, tomato paste, pressed garlic, spices, salt and pepper and return to a boil. Finally, add the beans and the macaroni and boil for an additional 10-15 minutes, stirring frequently, until the noodles are cooked and the vegetables have softened. Serve with homemade bread and margarine. Pingback: Vegan Family Meal Plans Part 2 | Live. Learn. Love. Eat. Pingback: Eating Vegan On A Budget – A Peek Into Our Vegan Family’s Grocery Shopping and How To Save | Live. Learn. Love. Eat. Sounds delicious! I’ve never made minestrone soup before and think I’ll try yours ! This was delicious! I somehow was out of tomato paste so I added tomato sauce. I had taken out a few chicken thighs for dinner but decided I wanted to make this soup instead so I just chopped up the chicken and added it. Glad to hear it! We love that soup too! Hi Tiffany!! 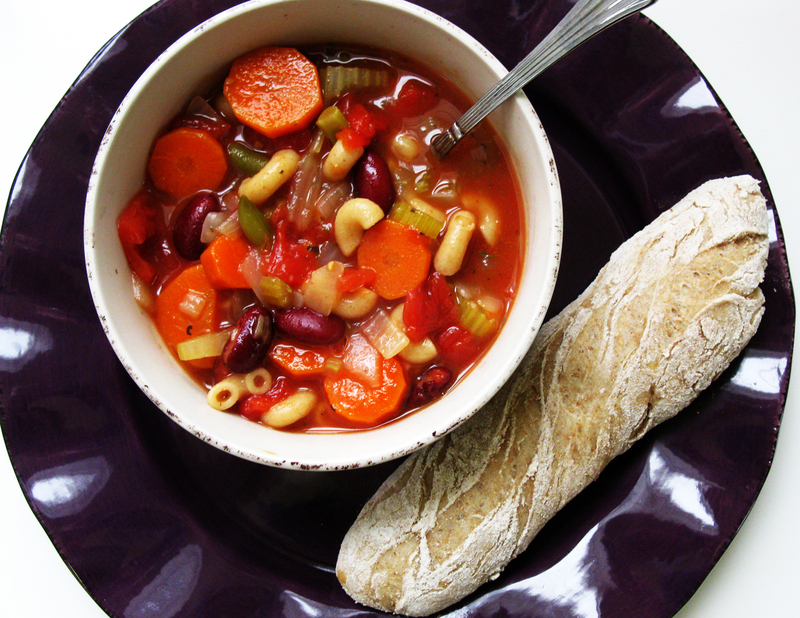 I love minestrone soup and have been looking for a good and easy recipe for some time now. I finally found it, after so many years, on your blog!! I’ve made the soup twice now…both times with excellent results! 🙂 Thank you! !